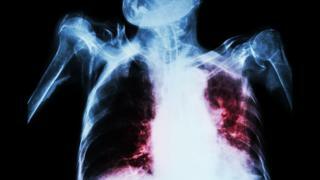 New international guidelines aim to halve the cost and time for treating multi-drug resistant tuberculosis (MDR-TB). The advice from the World Health Organization (WHO) should reduce treatment to around nine months. Currently, it can take as long as two years - and many patients fail to complete what can be a burdensome course. Doctors urged countries to implement the guidelines quickly. Conventional treatment can involve thousands of pills and daily injections. Deafness is one of the main side-effects. Cure rates are as low as 50% because patients abandon treatment, leading to further problems with resistance. The WHO is also recommending a faster test for MDR-TB, which gives results within two days - compared with the current three months. It hailed the guidelines as a "critical step forward". Around 5% of TB cases are thought to have resistance to the two most effective drugs. This translates into 480,000 cases worldwide - and 190,000 deaths from this form of TB every year. Many patients are not being identified. The shorter treatment plan costs less than $1,000 per patient - compared with conventional treatment which costs $2,400 for the medicines alone. The International Union against TB and Lung Disease and Medecins Sans Frontieres have been involved in trials of the new treatment method in Bangladesh and nine African countries, which have influenced the WHO's decision. The Union hailed today's advice as "an historic moment". Its senior vice president, Dr I D Rusen, told me: "When we first saw evidence about the shorter regimen, back in 2007, it was almost too good to be true. "Then further results which were consistent were presented at our conference late last year. Next year we'll have more evidence from a head-to-head trial comparing the two treatment methods. "The shorter treatment plan uses different doses of existing drugs which were previously used for leprosy. "So we hope there will be time for production to scale up, while countries get systems in place for the new guidelines, although it's possible there could be some supply issues." David Lister, an MSF TB Doctor working in Uzbekistan, co-ordinated one of the studies and described the huge difference it made. He said: "The prospect of two years of TB treatment drives parents to hide their children from treatment, teenagers to abandon their ambitions and adults to decide between providing for their family or getting healthy. "The fear of relentless suffering due to side-effects manages to outweigh any hopes of cure and returning to a normal life. "But when I say, 'it's only nine months' they say, 'I can do that'."